Have you seen the new images at the Paper Creator store? There's several fabulous card kits and lots of new precolored Sassy Cheryl images that are absolutely adorable. This darling little pup is called Bella Bunny Boo. I created this easel style card using my Silhouette Studio DE software and a cut file I bought at the Silhouette store. I merged two of the frame shapes together to form the base, then added another for the top of the easel. I created the patterned papers in GIMP using overlays from Melstampz. Added them to my patterns library in Silhouette Studio DE, created a smaller offset and filled the shapes with them. Cut out all pieces with my Cameo. Also used a ribbon, a branch punch from MS and some flowers from Michaels. I made this for my neighbor who has a little pup who is best friends with my mini poodle. I think she will smile when she sees this one. Gorgeous details and design! Love the added 3D flowers and interactive element! So glad that you join the fun over Simon Says Stamp Wednesday “Touchy Feely” Challenge! This is adorable Deloris, such a sweet image and fabulous shape. OH my gosh I LOVE this card!!! That lil doggie is just adorable! Beautiful coloring! Thank you for joining us at Craftin Desert Diva's Lots of Layers Linky Party! Wonderful card, all that cutting. It looks so good and that dog is so cute. OMG!! This is adorable!!! Great job!! Thank you for joining us for the Craftin Desert Divas "Lots of Layers" Linky Party!! Oh my goodness, this is adorable! The image is darling, and colored perfectly. Such a fun card! So glad you shared with us at Pile It On! This is just adorable. 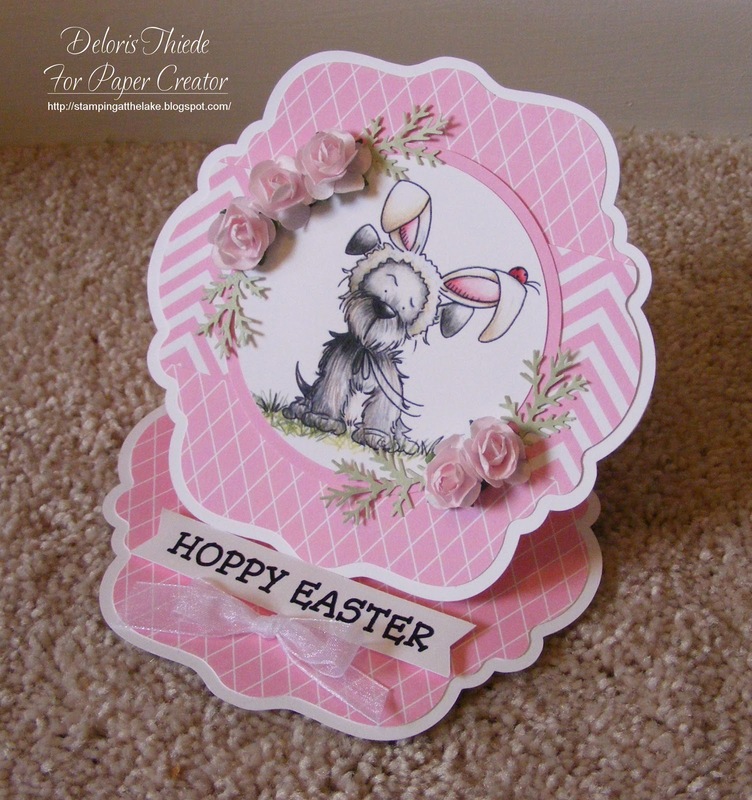 Cute image and fun reading how you made the card too! Awww it's adorable. Thanks for joining us at Craft Your Passion. Super sweet easter card. Thank you for joining us at Crafting From the Heart this week.